Solid State Lighting (SSL) Market size was over USD 34.5 billion in 2017 and industry expects consumption at over 10 billion units by 2024. Rising demand for energy efficient lamps primarily for residential applications on account of increasing conventional bulbs replacement may stimulate solid state lighting market size. These products have lower energy consumption, longer life and less space requirements which increases their suitability for lighting applications. SSL technology comprises of various products such as lamps, luminaires, high & low-bay lights, flood & downlights and under-cabinet lamps providing benefits such as high thermal management, optimized lumen production and cost efficiency which may further boost industry growth. Increasing product demand for automotive applications owing to smaller device size, aesthetic appeal and stringent regulations is predicted to accelerate growth of solid state lighting market size. In addition, increasing LED applications in indicator lighting products such as signals and signages may further stimulate market growth. Also, economic growth in Thailand, Malaysia and Indonesia coupled with population rise is estimated to boost the automotive sector, further stimulating the SSL product demand. Global automotive market is expected to surpass USD 5 trillion by 2024 which represents tremendous growth potential for solid state lighting market. Increasing R&D efforts by manufacturers to achieve cost effective production and higher product efficiency is likely to stimulate solid state lighting market growth. Recent advances in SSL production technology has led to improved product flexibility, controllability and emission rates. 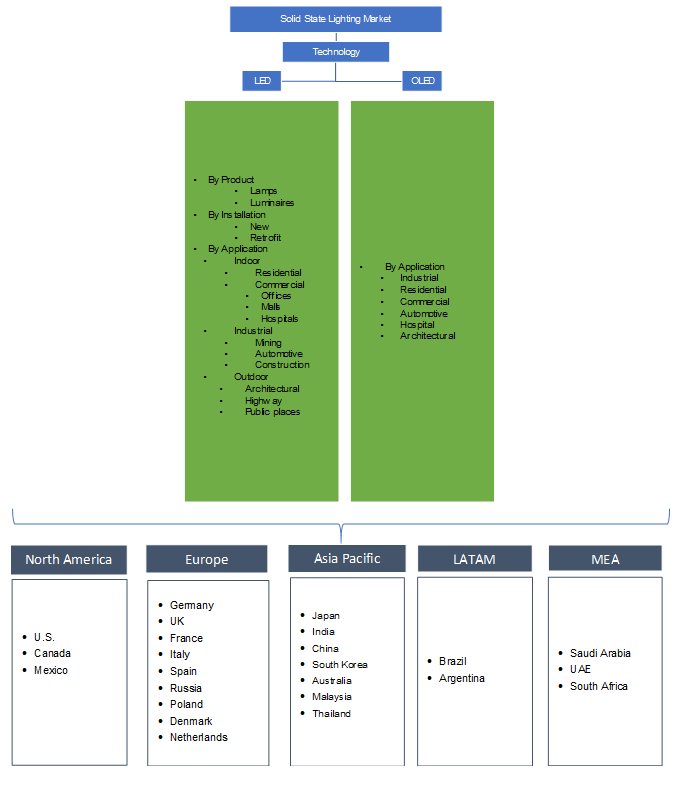 Government subsidies and investments primarily in Indonesia, Brazil and China may also stimulate solid state lighting market growth in these regions. Global LED market for horticulture applications may surpass USD 3.5 billion in the predicted timeframe owing to increased adjustability and improved crop yields, thereby stimulating market growth. Various smart city projects initiation in South Korea, Malaysia, Japan and Brazil to improve the quality of life by reducing resource consumption, costs and wastage is predicted to accelerate solid state lighting market growth. LED use in such projects will enable governments to reduce energy consumption, maintenance frequency and allow integration with embedded systems thereby enhancing product demand. For instance, in 2017, the adoption of SSL lamps in India provided cost savings of approximately USD 3.75 million which is expected to provide maximum gains in future further boosting the SSL market growth. High manufacturing cost of SSL technology along with its low brightness & relative inefficiency as compared to incandescent bulbs is likely to hamper market growth in the predicted timeframe. High component cost and manual manufacturing requirements may drive up manufacturing costs. However, innovative strategies for achieving cost effectiveness along with longer life of SSL products may provide various opportunities in the solid state lighting market growth. Global LED-based SSL market size is poised to surpass USD 80 billion by 2024 pertaining to their low power consumption and rising demand for high brightness LEDs. These products are used in panel indicators, automotive lamps and large display screens which may boost solid state lighting market size. Government has mandated various laws or policies regarding product utility and implementation of tariffs of LED component import catering to the domestic market, may stimulate industry growth. OLED-based SSL market may register gains close to 11.5% over the forecast period. Rising demand for flexible displays, smartphones, signages, wearable devices and automotive may boost the solid state lighting market. These products exhibit several advantages such as sunlight readability, energy efficiency, and higher recyclability as compared to conventional LCD products. Rising demand from luxury car producers along with increasing collaborations between LED and automotive manufacturers for flexible light production may boost product demand in the automotive sector thereby promoting SSL market growth. North America solid state lighting market size driven by Mexico, Canada and the U.S. may witness substantial gains at over 11.5% during the forecast timeframe. Reduction in manufacturing cost and rising horticultural applications for plant ignition is likely to stimulate product demand. Moreover, this region is witnessing a rise in the local assembly of SSL products and increasing demand for industrial & commercial LED products such as tunnel, high-bay, panel and troffer lights which in turn may boost regional industry growth. 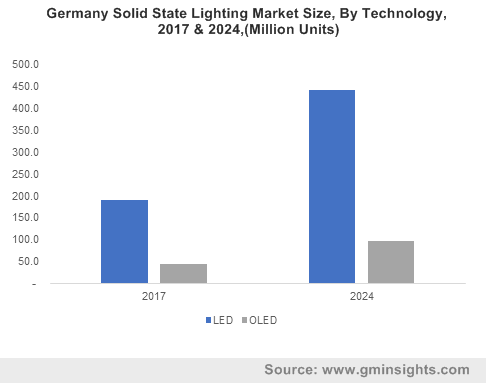 Europe led by UK, France, Italy, and Germany solid state lighting market demand is expected to surpass USD 20 billion by 2024. Decreasing usage of inefficient lamps coupled with rising LED demand for exterior illumination of vehicles may contribute to market growth. New car registrations in Europe was over 14.5 million in 2017 pertaining to economic recovery and rising demand for electric vehicles which indicates ample growth potential for solid state lighting market in the region. Asia Pacific solid state lighting market driven by China, India, South Korea and Japan should register significant gains above 12% over the projected timeframe. Rising IoT adoption for smart city projects coupled with government endorsement of energy-efficient lights to minimize energy costs and smart city development projects may stimulate product demand in the region. Global solid state lighting market share is moderately fragmented with major industry players such as General Electric, Cireon, TSMC, Molex, and OSRAM. Manufacturing companies are focusing on decreasing the overall product costs by switching over to full-wafer manufacturing techniques. Moreover, industrial participants are engaged in mergers, acquisitions and partnerships to expand market share which is likely to promote solid state lighting market growth. These products are manufactured by encasing thin layers of semiconductor materials of varying electron densities in plastic. Solid state lighting lamps offer longer product life, low heat generation and eco-friendly properties. Moreover, these products are resistant to vibration and shock damage as compared to conventional lamps and provides prevention from filament evaporation thereby offering higher product life and better performance. These products are majorly utilized by the residential, commercial and industrial lighting sectors for both indoor and outdoor illumination purpose. Rising awareness for increasing energy efficiency coupled with incandescent bulbs ban in several countries is predicted to accelerate SSL market demand.